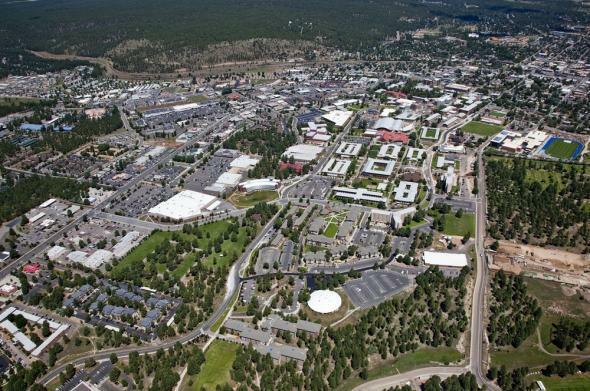 One dead, three injured in shooting at Northern Arizona University in Flagstaff. The Northern Arizona University campus in Flagstaff, Arizona. Police say four people were shot, one of them fatally, by an 18-year-old freshman after a “confrontation” at about 1:20 a.m. Pacific time this morning near a dorm on the campus of Northern Arizona University in Flagstaff, Arizona. The suspected shooter, Steven Jones, is in custody. The victims of the shooting were also students. The dorm, Mountain View Hall, houses a number of students who are members of fraternities and sororities. The Delta Chi fraternity confirmed to the Washington Post that some of its members were “involved” in the shooting, though it did not give further details.